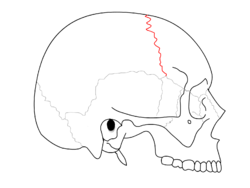 The coronal suture is a dense, fibrous connective tissue joint that separates the two parietal bones from the frontal bone of the skull. a high, tower-like skull called "oxycephaly"
a twisted and asymmetrical skull called "plagiocephaly"
"Sagittal suture." Stedman's Medical Dictionary, 27th ed. (2000). Moore, Keith L., and T.V.N. Persaud. The Developing Human: Clinically Oriented Embryology, 7th ed. (2003). Animation. Coronal suture shown in red. Frontal bone and parietal bones. Superior view of anterior part of the skull. Coronal suture runs horizontally. Coronal suture seen from inside. The skull at birth, showing the lateral fontanelle. Coronal suture of new born baby. Wikimedia Commons has media related to Coronal sutures. This page was last edited on 27 November 2018, at 00:24 (UTC).